The Dovekeepers is a book of historical fiction set during the First Jewish-Roman War. The book begins during the destruction of Jerusalem and the temple in AD 70 and follows the journey of four women who end up together in the last Jewish holdout, a mountaintop stronghold called Masada. According to the Jewish historian Josephus, the last group of Jewish zealots who rebelled against Rome held out for months at this seemingly impenetrable fortress. Eventually, the Roman legions under Lucius Flavius Silva, built a siege ramp and broke through the walls. According to Josephus, they found the 960 inhabitants of Masada already dead. They had committed mass suicide rather than allow the Romans to defeat them. Josephus tells us that only two women and five children survived. 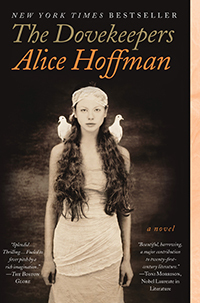 Alice Hoffman builds her story around the history of Masada. The book follows four women to Masada and tells their difficult stories as women living in First Century Palestine. The book is well researched, though Hoffman admittedly adds an element of magic and witchcraft which probably would not have been present there. If you read any of Hoffman’s other books, they almost always include magic and “misunderstood” witches. The book has an obvious feminist agenda and twists some of the facts about ancient religions (like the worship of Ashtoreth) to fit her elevation of goddess worship. In our book club discussions, most enjoyed the book. The majority of the women in our group could relate to one or more of the protagonists. The book is quite long (over 500 pages) and some found it somewhat depressing. I think women tend to enjoy it more then men. I personally enjoyed the cultural and historic insights the author gave (though modern perspectives and agendas were sometimes imposed on the characters). Masada occurred just forty years after Jesus’ death, thirty years before the last book of the New Testament was written. Though not mentioned in the Bible, the fall of Jerusalem and the destruction of the temple are significant events in the history of Christianity. Jesus foretold them. They affected the lives of many early Christians. For that reason alone, I found The Dovekeepers an interesting read. What do you think of The Dovekeepers? Leave a comment and let us know.